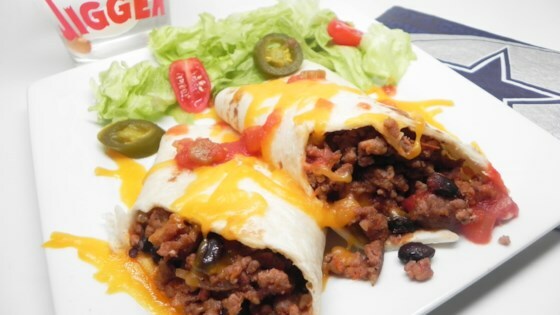 "Using lean ground turkey, spices, black beans, and salsa, you will create a tasty, quick burrito." Heat olive oil in a large skillet over medium heat. Add ground turkey and cook until no longer pink, about 5 minutes. Season with garlic powder, onion powder, salt, and black pepper. Stir in salsa and black beans; cook until heated through, about 5 minutes. Cover tortillas with moist paper towels; microwave on high for 30 seconds. Spoon turkey mixture into each tortilla. Sprinkle with Cheddar cheese. These were super simple and turned out great. Be sure to use a salsa you are familiar with and like. My go to is Pace picante and it worked perfectly in this. This recipe is a keeper.